A powerful, convenient air compressor that allows for even airbrushing without excess noise. As part of the Silentaire collection, the Silentaire Sil-Air 100-50 Ultra-Quiet Compressor barely makes any sound, yet provides a powerful machine for use while airbrushing. Excess water is removed from the compressor's tank and hoses by its pressure regulator with built-in filter.The right amount of air flow is smoothly and efficiently regulated thanks to the attached tank pressure valve, pressure gauge, and air filter. 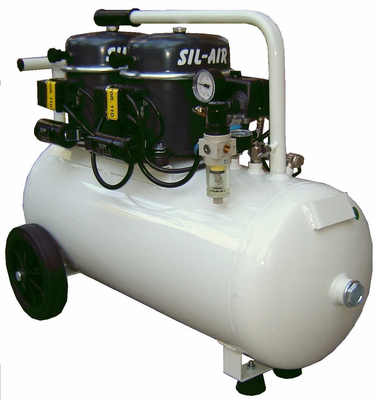 Although the Sil-Air 100-50 hardly sounds like it is even operating, the 2-1/2 horsepower motor, 4.3 CFM free air, and the 13 gallon tank gives the user ample power to complete an airbrushing project. The compressor works using 84-114 PSI of operating pressure that ejects the paint strongly and evenly throughout the job. Weighing 184 pounds, it is sturdy enough not to tip over but light enough to make the machine portable using its convenient built-in carrying handle. The durable construction allows for years of constant, reliable use on a daily basis. The manufacturer's warranty protects the buyer from mechanical mishaps, giving the buyer confidence when choosing the product. Oversize Shipping: $105.95.